3.6 out of 5 based on 83 bloggers and 10 commenters. Ubly is a free blogger template adapted from WordPress with 2 columns, right sidebar, fresh look, rounded corners, girly looking and vectorial elements. Excellent template for blogs about art or fantasy. nice and colourful template. 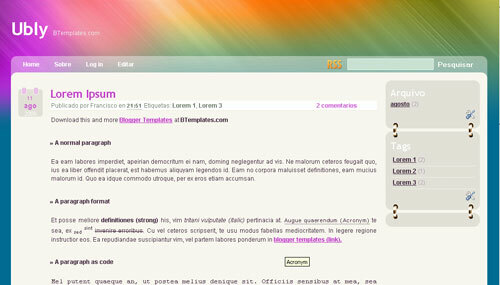 thanks to author and btemplates. Nice template. I like the head so much. Thanks Francisco and Btemplates. Thank you for this template! I love it! Yes, i like this template. Very…very cool and colourfull. Necesitas tener instalado un programa para descomprimir el archivo. Te sugiero que uses Izaarc (búscalo en Google, es gratuito) y lo instales antes de intentar abrir el archivo que descargaste.